Two weeks ago we were still in November and the temperature was in the 40’s. Today is December 10, and the outside temperature in St. Peter this morning was 7 degrees below zero (-22 with windchill). Thanks to a snowstorm riding a strong cold front that has affected virtually all of the country, most of southern Minnesota is now covered in at least half a foot of snow (8 inches here in St. Peter). Accompanying the heavy snowfall were winds gusting up to 40 miles per hour on Wednesday, which resulted in a campus opening delay of several hours. Below is a photo of these conditions as seen in the Arb around noon yesterday. 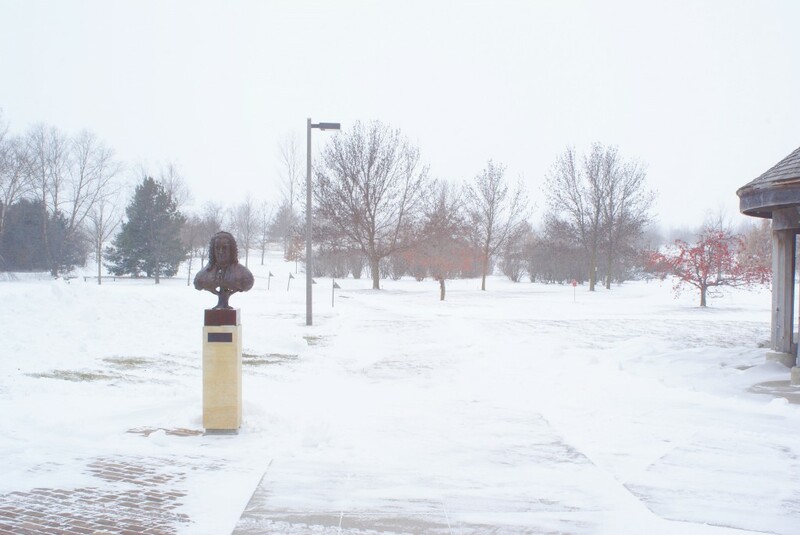 Looking west from the Interpretive Center into the snowstorm, 12/9/09. OMG!! I SPOTTED 2 TURTLE DOVES AND A PARTRIDGE IN A PEAR TREE! !